The Nittaku S-7 is part of the S-Series, and is a product of German craftsmanship and European spruce wood. Spruce is well known as an exquisite wood that is used in the highest quality musical instruments. Nittaku's S-Series brings you this high quality wood for a reasonable price. The S-7 is a fast blade with 7 plies of Spruce and Ayous wood. The American Walnut handle is laser mark sealed to keep the beauty of the natural wood. Made in Germany. After using 3 different carbon blades, I switched to this beautiful all wood blade. The blade is a touch heavier than some of the lighter carbon blades (ave. 90g) but very well balanced. I have been using over a year and plan to keep using. Currently, I am using this blade with Xiom Omega VII Pro FH and Omega VII Euro BH for an excellent set up for my topspin/attacking style. 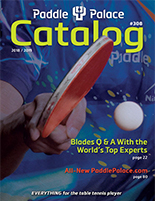 Full disclosure, I am a Paddle Palace employee. Very fast, well-made all-wood blade! I tried the S-7 first (before trying S-5) and found it very fast with Nittaku G1 Fastarc (Max FH) and Rakza 7 (2.0 BH). Similar to Nittaku Acoustic all-wood, maybe a touch slower. Craftsmanship is superb, and good spruce face. Comparable to some fast wood-carbon blades, but better touch.